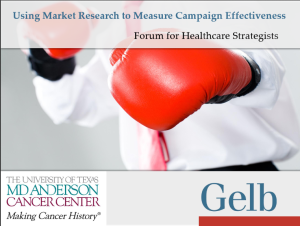 Presented at the Forum for Healthcare Strategists, this presentation covers how to use market research to measure campaign effectiveness. We focus on the role of marketing, demonstrating marketing’s value, success and getting started. This presentation was created and presented along with MD Anderson Cancer Center, and includes their experiences and examples.